The dismissal has now become part of Australia’s political and constitutional history. 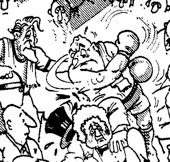 Although thirty years have passed, the dismissal is still remembered as a moment of unique drama. When the Whitlam Labor Government was dismissed, debate raged about implications for the future of democracy in Australia. For some, the events of November 1975 were seen to threaten the foundations of stable Government and lay siege to democracy itself. For others, democracy was not at stake but at work, operating to restore stable Government. Thirty years on, the rules of the Constitution which allowed for the dismissal of the Whitlam Labor Government remain unchanged. The different readings of the Constitution put forward by Gough Whitlam and Malcolm Fraser in 1975, and of the conventions surrounding the operations of the Constitution, are still possible. Our Constitution remains ambiguous on the question of the Senate’s powers vis-a-vis the House of Representatives, and the propriety of the exercise of those powers. Whether or not it is appropriate for the Senate to exercise its power to block Supply, it retains that power and can use it to force an election. Yet the Constitution does not specify whether the Prime Minister is required to call an election under such circumstances. Therefore, a possibility remains that Parliament may again become deadlocked. Moreover, should such a situation arise, the Governor-General still holds reserve powers to break that deadlock. Gough Whitlam remained at the helm of the Labor Party throughout the first term of the Fraser Government. He resigned from Parliament in 1978, following Labor’s defeat in the 1977 election. In 1983, the new Labor Prime Minister, Bob Hawke, appointed him Ambassador to UNESCO. He remained in the position until 1986, thereafter continuing to campaign for Australia’s adherence to United Nations conventions on human rights, environment and heritage. Whitlam has also maintained close involvement with Australian and International cultural organisations, being former Chairman of the Australian National Gallery and a Member of Honour of the World Conservation Union. His views concerning the circumstances of the dismissal of his Government remain unchanged. Thirty years on Gough Whitlam still ‘maintains the rage’. Malcolm Fraser remained Prime Minister until 1983 when Bob Hawke and the Labor Party were elected to Government. Following his resignation from Parliament, Fraser became closely involved with the affairs of the Commonwealth. He was one of the group of Eminent Persons central to negotiations to end apartheid and introduce full democracy to South Africa. He was Chairman of Care Australia, and was involved in securing the release of Australian hostages Steve Pratt and Peter Wallace from Serbian authorities following the war in Kosovo. Feeling vindicated by his massive election win on December 13, 1975, Fraser sought to distance himself as much as possible from the drama of the dismissal. He has published no books on the subject. Fraser remains confident, however, that the action of forcing Gough Whitlam to the polls was both necessary and expedient. Of all those involved in the dismissal crisis, it was the Governor-General, Sir John Kerr, who became the main target of public anger and hostility. 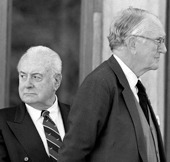 From the moment the Whitlam Labor Government was dismissed, Kerr became deeply concerned with his personal safety and was rarely seen in public without security personnel. Over the years his health increasingly deteriorated. Many of his colleagues on both sides of politics believed that he was unable to cope with the aftermath of his decision. Kerr remained Governor-General until his resignation in December 1977, after which time he left Australia to live in Europe. Whilst in Europe he wrote his only book on the subject of the dismissal, Matters For Judgment (1978). Returning to Australia six years later he lived out of the public gaze until his death in 1991. Until the end, he defended his role in the crisis. The following essay was first published in the 2000 exhibition catalogue, Dismissed! Whitlam, Fraser, Kerr and the Story of 1975. It is republished here (and slightly amended for the 30th anniversary of the event in 2005) with the permission of the author, Professor Michael Coper, Dean of Law and Professor of Constitutional Law at the Australian National University. The dismissal of the Whitlam Government by Governor-General Sir John Kerr on 11 November 1975 was perhaps the most dramatic and controversial event in Australia’s constitutional and political history. On one side of the argument, the dismissal of an elected government by an unelected official was met with shock and outrage and mourned as the death of democracy in Australia. On the other side, the breaking of the deadlock that had provoked the crisis and the immediate consequence—the calling of an election—were celebrated as a fitting end to a bad government and hailed as the restoration of democracy in Australia. Who was right, and what is the legacy of these events twenty-five years on? The issue that grabbed the limelight—then and ever since—was whether the Governor-General should be demonised or lionised. But the heart of the problem lay with the Senate and its proper place in Australian democracy. Our version of democracy is more than a matter of simple majority rule. For a start, the federal system divides power between the Commonwealth and the states and territories. In addition, different kinds of power—legislative, executive and judicial—are divided between different institutions. And the exercise of Commonwealth legislative power involves a further sharing of power: the Parliament consists of two Houses, a lower House—the House of Representatives—elected on a population basis, and an upper House—the Senate—also elected but with equal representation for each state. In the context of these power-sharing arrangements (the diffusion of power itself being one of the bulwarks of democracy), the heart of the problem in 1975 was whether the power of the Senate—popularly elected but nevertheless the less democratic of the two Houses—properly extended to withholding consent to the government’s budget. In other words, could the Senate, and should the Senate, block ‘supply’? The difficulty stemmed from our constitutional origins. On the one hand, we inherited the British system of responsible government, in which governments are made and unmade in the lower House and in which, at least since 1911, the upper House cannot block the government’s money Bills. On the other hand, we also copied from the Americans, borrowing in particular the idea of a written, federal constitution. The federal idea entailed a popularly elected Senate (unlike the British House of Lords), which, through equal representation, would give a powerful voice in the national Parliament to the states as units of the federation. No solution was devised, other than to set out the powers of the two Houses in relation to money Bills and to leave their exercise to be governed by the operation of the unwritten ‘conventions’ of the Constitution. A time-bomb was set, and it exploded in 1975. The unwritten conventions of the Constitution, although elusive, capable of development over time, and characteristic of the subtlety and understatement of the British side of the constitutional inheritance, are an integral part of the system of responsible government. It is sometimes a shock to the uninitiated to learn that the office of Prime Minister is not mentioned in the Constitution. That is because the rule that the Prime Minister is the leader of the party that wins a majority of seats in the lower House is a matter of convention. The written Constitution confers executive power not upon the Prime Minister but upon the Governor-General, as representative of the Queen. The Governor-General appoints the Prime Minister, in accordance with the above-mentioned convention, and exercises the powers vested in him or her by the Constitution in accordance with the most important convention of all: the convention that the Governor-General acts only on the advice of the Prime Minister. Because of the operation of this convention, the Governor-General’s superficially wide powers are formal rather than real. The convention that the Crown acts only on the advice of the elected government is the linchpin of responsible government and fundamental to the practical achievement of democracy in a constitutional monarchy. Those who really make the decisions are answerable to the electors: Ministers are responsible to the Parliament, which is in turn responsible to the people. The propriety of Sir John Kerr’s rejection of Prime Minister Gough Whitlam’s advice on 11 November 1975 to call a half-Senate election, and his consequent dismissal of Mr Whitlam and appointment of Opposition Leader Malcolm Fraser as Prime Minister, turns on whether circumstances had arisen to justify exercise of the so-called ‘reserve powers’ of the Crown: the power to act, as an exception to the general rule, without or against the advice of the government of the day. But we are running ahead of the story. Return to the nub of the problem: the clash between, on the one hand, the principles of responsible government, particularly the principle that governments are made (by winning a majority of seats) and unmade (by losing a no-confidence motion) in the lower House and that budgets are the province of government, and, on the other, the powers of the Senate, particularly in relation to money Bills. Consistently with the principles of responsible government, the Constitution prevents the Senate from initiating or amending most money Bills, but appears to leave it open to the Senate to reject such Bills altogether. Assuming this to be legally correct (which, with a few exceptions, was not seriously disputed in 1975), it might have been envisaged in the 1890s that the Senate—acting as the states’ House—could have an objection to the particular Bill in question (although, if the Bill were part of the budget, the constitutional procedures for resolving deadlocks between the two Houses were scarcely expeditious). But long before the crisis of 1975, the idea of the Senate acting as a states’ House had been well and truly subverted by the development of the party system, and the blocking of supply in 1975 was not a move by the Senate to raise objections to the budget but was rather a move by the opposition to force the government to an election. The opposition’s plan was no secret: the blocking of supply was undertaken with that express purpose. Here, conflicting conventions were invoked by each side, both based on imperfect analogies with Westminster. The government argued that it was entitled to hold office so long as it had the confidence of the lower House, and that the Senate ought therefore not block supply. The opposition argued that a government that cannot secure supply must either resign or call an election. The latter proposition was appropriate for the UK, as a government there could only fail to secure supply if it lost the confidence of the lower House, but the bare analogy did not take into account the divergence of those elements in Australia. The former proposition, asserting the right to remain in office in the absence of a no-confidence motion in the lower House, was also correct for the UK, but the bare analogy did not take into account the greater power of the Australian Senate. Hence, the alleged corollary that the Senate ought not exercise that power. The idea that the Senate ought not exercise powers it legally possessed was ridiculed in some quarters in 1975. Yet there is nothing really startling about it, when you consider that the core convention that the Governor-General acts only on advice is based on the same idea. Certainly, rumours abounded that at least some opposition Senators felt discomfort about the proposed use of the Senate’s powers to block supply, although the vice-regal intervention prevented us from ever knowing whether the discomfort might eventually have turned into dissent. The very point of constitutional conventions is that they restrain the exercise of legal powers in the interests of democracy and representative government. The historical evolution of democracy in the UK from the absolute power and divine right of kings is largely the story of the development of these conventions. Indeed, it is only the conventions of the Constitution that make the position of a monarch tolerable in a modern democracy. The real question in relation to the Senate, therefore, was whether, in the interests of good democratic government, it was appropriate for the Senate to block supply. To answer this question in the affirmative, one might have thought that the justification must be found in the major rationale for the existence of the Senate and its state-based composition: the federal idea. Yet the blocking of the budget had nothing to do with federalism. It was a strategy of the opposition, which (as a result of some fortuitous opportunities to fill casual vacancies, those incidents themselves giving rise to controversy about departure from convention) happened to have a majority in the Senate. Neither did the justification lie in the function of the Senate as a House of review, as the objection was not to the Bill itself. So the question became, is it appropriate for an opposition to, in effect, determine the timing of the next election? Proponents of fixed-term elections are unhappy with the power of a government to determine the timing of the next election (and most state and territory Parliaments now run for fixed terms). But to allow an opposition—the party that lost the last election—to call the next, seems an extraordinary addition to our catalogue of democratic safeguards, which already include compulsory lower House elections every three years. One might think that such an addition was rather outweighed by the scope for instability inherent in the temptation put before an opposition to take any opportunity to get back into government. And one might make that judgment irrespective of one’s view of the merits of any particular government—including the Whitlam government of 1975. So, the argument that no damage was done to democracy because the end result of the opposition’s action was an election can be seen to be somewhat simplistic. True, the electorate in theory had the opportunity at that election to repudiate the actions of the opposition and the Governor-General by returning the Whitlam government (as it had in 1974), but once an election was called it was always going to be determined on economic issues, not on issues of abstruse constitutional theory. It is a fair conclusion that the Senate acted improperly in blocking supply in 1975. But it did act. As Huxley once said of the tragedy of science, we may have here the destruction of a beautiful hypothesis by an ugly fact. Confronted with the fact, the Governor-General was in a difficult position. What should he have done? The existence of the ‘reserve powers’ was not in doubt. If a government defeated at an election refused to resign, the Governor-General would be entitled to dismiss it and to call upon the leader of the party that had won the election to form a new government. This action would rectify a breach of convention and restore the principles of representative democracy. So the guiding principle must be, what action is best calculated to further, or perhaps to salvage, the principles of representative democracy? As we have seen, the opposition argued that the Governor-General should vindicate the convention that a government which cannot secure supply must resign or advise an election. The Chief Justice, Sir Garfield Barwick, in an intervention which is now generally regarded as improper, advised the Governor-General to the same effect and, moreover, that he not only had the power but also the duty to dismiss the Prime Minister and commission another Prime Minister who would give the appropriate advice to dissolve Parliament and call an election. But, as indicated earlier, the so-called convention was transplanted from a different context, where not securing supply was equivalent to losing the confidence of the lower House. When the opposition’s arguments were unpacked, it was evident that the ‘failure to secure supply’ was the consequence of the questionable action by the opposition in the Senate. In these circumstances, the action best calculated to further, or to salvage, the principles of representative democracy was for the Governor-General to accept the advice of the Prime Minister—the leader of the majority party and the person who enjoyed the confidence of the lower House—to call a half-Senate election. Any other course (including not only the rejection of that advice and dismissal of the Prime Minister but also the equally partisan course of urging the Senate not to block supply) was calculated to endanger the neutrality of the Crown. The dismissal was, at the least, premature. Had the passage of time without legislatively authorised expenditure of public funds eventually propelled the government into any illegal activities, the arguments might have been different, though even there illegality might be thought to be a matter for the courts. Had the Prime Minister’s advice to hold a half-Senate election plunged the country into chaos (assuming that the Senate would not have relented on supply), the government would have had to bear the political consequences—that is the nature of democracy. So, too, if the Prime Minister had made an unlikely attempt to dismiss the Governor-General—he also would have had to bear the political consequences of that action in due course. Appreciation of this fact might have led another Governor-General in the same circumstances to have warned the Prime Minister of his proposed course of action. But he did not, and the rest is history. What is the legacy of these events twenty-five years on? All attempts to alter the structure of our constitutional arrangements to prevent a recurrence of 1975 have failed, whether they be Labor’s preferred course of reducing the power of the Senate or the conservative parties’ preferred course of mandating an election once the Senate does block supply. So, in theory, it could all happen again, although it required in 1975 such an extraordinary confluence of chance events, and such a volatile mix of particular personalities, that, in practice, a repeat is highly unlikely. Presumably, also, future scenarios will be affected by knowledge of the aftermath of 1975. But the unresolved tension remains between responsible government and federalism. Because that unresolved tension remains, the controversy surrounding the reserve powers of the Crown hung over the recent debate about becoming a republic and virtually ensured that only a minimalist model would be on offer, one that preserved the status quo in terms of the powers of the new Head of State. The content of that status quo is, however, uncertain and disputed, and while it remains so, any prospect of codifying the reserve powers is remote. And the failure of even the minimalist model at the 1999 referendum suggests that more fundamental change will be even more difficult. From the standpoint of the healthy long-term functioning of Australian democracy, the Senate, or rather the opposition acting through the Senate, and the Governor-General, fell into error in 1975, the former because of the irresistible pull of short-term advantage and the latter because of a mistaken principle and misplaced secrecy. Despite the tendency of facts to become norms, we can only hope that, although there has been insufficient agreement to facilitate structural change to the Constitution, the error will in due course be sufficiently widely acknowledged that its repetition will accordingly be less likely. 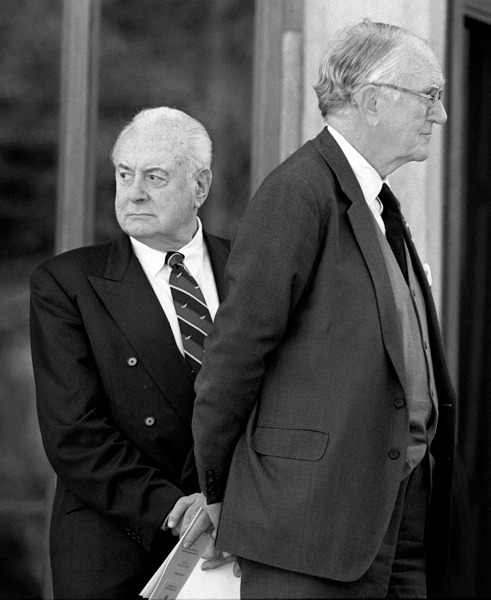 Gough Whitlam (left) and Malcolm Fraser (right) at the funeral in 1999 of the former Member for Bass and member of the Fraser Cabinet, the Hon Kevin Newman. Image courtesy of News Limited. 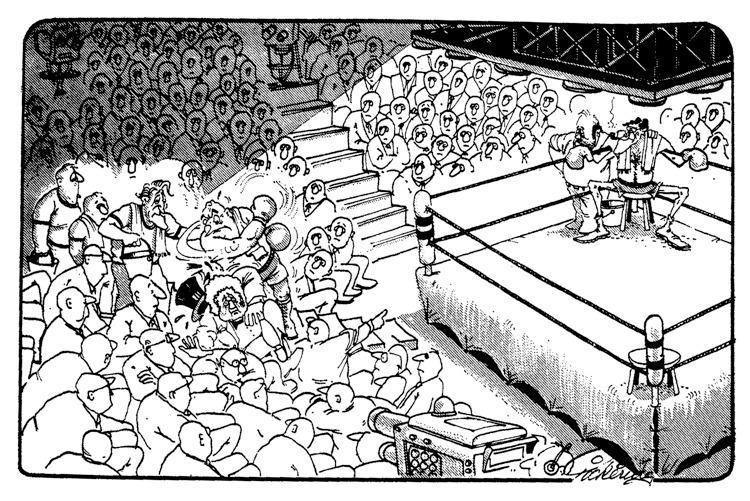 Cartoon by Larry Pickering. Reproduced with the permission of Larry Pickering.